Experts on nuclear confrontation say that a nuclear war is a very real possibility here in the 21st century. The US and North Korea are just one misstep away from nuclear destruction. But that hasn’t stopped New York City officials from beginning to take down outdated nuclear fallout shelter signs posted at public schools. And even though it might be a practical decision, removing the signs somehow feels premature. As Reuters reports, many of the old nuclear shelter signs you see on buildings around New York are from the 1960s and direct you to areas that are no longer nuclear fallout shelters. Community fallout shelters were first coordinated in public spaces like schools and libraries by the Office of Civil Defense, which was dissolved in 1970. 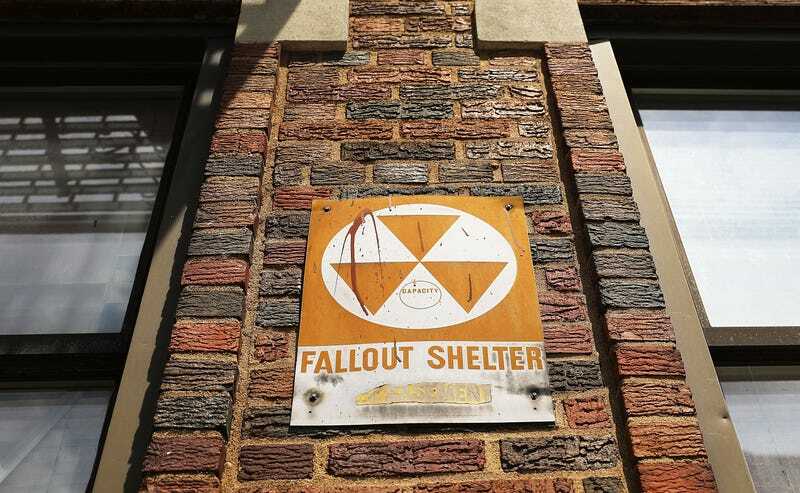 Fallout shelter signs are still seen all around the country, and while they disappear on occasion when an old building is torn down, major cities like New York have typically made no coordinated effort to remove them. That changed recently when the city’s Department of Education decided it was time to take down as many as they could find on public school buildings. The goal, according to officials who briefed Reuters, is to get them all down by January 1st, 2018. Signs that are still on private buildings will likely remain. The famous nuclear fallout shelter sign was designed by Robert W. Blakeley, who died this past October at the age of 95. Blakeley didn’t expect that his orange and black fallout sign would define his legacy, telling The New York Times a few years before his death that he basically never though about the design after he made it. But again, it somehow feels all too premature to remove the signs. Serious civil defense coordination has fallen out of fashion, but in a world where madmen like Donald Trump and Kim Jong-un have control of the nuclear buttons, preparedness doesn’t seem so silly anymore. Back in the 1960s, there were serious debates about whether the government had any responsibility to protect the public with shelters meant for large numbers of people. These days, Americans seem resigned to the fact that if nuclear war comes, everyone is on their own. The signs are relics of another era; things that we used to see and laugh about in my public school in the 1990s. But they’re not so funny anymore. The Cold War might be over, but the threat of nuclear war feels all too real as we move into the year 2018.